And I thought things were going really well. I love my puppy. He let me sew for several hours on Tuesday. He seemed to be letting me work on my nine patch blocks this morning. Well, he did steal a spool of thread in an effort to get my attention, but I took it away from him and told him "No!" Can you even believe that he did that? It was ON. He must have pulled the plug out of the socket before he bit it in half. He could have been killed. OMG. Excuse me while I go puppy proof my house better. Anyone have any advice for me? Oh dear, fortunately an iron can be replaced. Perhaps when you leave the room you might need to take Ozzie with you, or put him in the backyard for a quick tinkle. Reward him when he's well behaved with praise, a pat and perhaps a tiny treat. They learn quickly, that praise and treats come with good behavior. I remember Sophie's puppy days well. We had several casualties, including one of a pair of expensive shoes (mine) and many, many spools of thread. I constantly worried about electrical cords. All I can tell you is that he'll probably grow out of it if you keep letting him know that chewing things that aren't his isn't acceptable behavior. Also be sure to not leave any dangerous substance around where Ozzie can get into it. When Soph was a pup, Vann had a bottle of Ibuprophen in his brief case. While we were gone, Sophie got the case open somehow, crewed open the bottle (they aren't doggie proof) and ate a bunch of them. Fortunately she threw up soon afterward. Most of the pills were still whole. No harm done to her, thank God. It's a lot lilke having a baby in the house. Constant vigil. Oh, my! I take it is wasn't plugged in. Puppies will do the darndest things. Oh no - I'm glad Ozzie is okay after that! Can't say the same about your iron. I don't have any advice, sorry. I guess you still need to keep a constant vigil. Remember what it was like to have little ones around? I mean like 1 and 2 year olds...yeah...ya gotta do your house like that again! I'm feelig for you! Max is almost a year and just starting to show some mature behavior. It must be a terrior thing, as Rocket did the same thing.. well almost, he only got about half way through the cord before I found him. I just basically told him no everytime he got near it, and watching him around the other cords. I think its the moving cord that interested him since he didn't bother any lamp cords. when our dog was just a pup he had a few close calls with dangerous items, a fishing hook for one, and another was a ball that was a bit too small and got stuck down his throat! he almost died from that one but luckily my husband kept fairly calm and managed to work the ball out from the outside of our dogs throat! scary stuff, but with gentle actions, praise and calmness he has become the best dog in the world. He is so well behaved that many people comment on him all the time. That puppy stage in definitely really hard but it sure pays off if you persevere and give lots of love. Thank goodness with Jack it's only been small things like shoes, oh, and maybe "one" piece of furniture....I guess that wasn't so small! LOL! But, a previous dog that we had, when he chewed the outside phone cable in half for the THIRD time, we had it enclosed in pipe! OH, and the same dog, also outside, chewed the large electrical cable that connects the air-conditioning unit to the house! HOW that did not electrocute him I do not know! It was summer, and it was running! My best advice is not to let him out of your sight when he is that young. They really do need constant supervision. He could either have electrocuted himself or had the iron fall on him and hurt him bad. Thank God that neither scenario came true! Ozzie is a sweetie. My best advice is a puppy training class at your local pet store. I did one when my Bailey was a pup & it made all the difference. Even if that is the only obedience class you ever do with your dog - it's well worth the time and money. Bailey earned so many good behaviors (like not running away - waiting/staying - coming when called - who's in charge [me!]. . . ) & I learned how to teach him what to do (& not do) in a way that he understands. Also the insite of the trainier is at your disposal - & they have dealt with it all. I realized how well this has worked - as when a delivery man commented the other day when I walked him out the front door & when Bailey went out to the fornt yard & didn't run off & came when I called him. . . , the gentleman commented, "Man, - I wish my dog would do that. . . Mine would have been long gone. . . " It reminded me of how benificial the class has been to our everyday lives. Oh my! My dog did the same thing about 13 years ago. She was still a puppy and she chewed a lamp cord in half. My dad reconnected the wires and covered it with electrical tape. We lived with the reminder until we threw out the lamp. eep..the death of the iron!!! Have you thought of cage training? It's easy and it actually is good for dogs to have "den" like place to lay in. 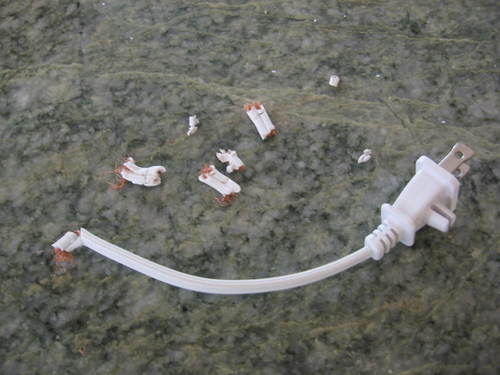 My miniature schnauzer puppy Mattie chewed through my brand new Bernina plug and lived to tell about it.....oh the joys of puppies! Oh Nicole he had a furry guardian angel on his side. Those little puppies sure can be stinkers and they always get into something that we never think about. I'm so glad he's OK.
OMG ROFLOL!!!! I'm sorry, I don't have any advise for you but I laughed when I saw that. Puppy's are a whole lot of work aren't they? Like having a new baby in the house. Good luck is all I gotta say. OMG!! I'm so glad Ozzie is okay!! You needed a new iron anyway, right? It makes you wonder how dogs survive their puppyhood, doesn't it? It's the same as having a toddler in the house - when it's quiet, you know they're being naughty! I take Gracie with me everywhere I go - I don't let her out of my sight. That's mainly because of the potty training issue, but I can't trust her not to chew on something such as an electrical cord or something else as dangerous, or maybe my favorite pair of slippers. You just never know what they're going to do next. They are so worth all the trouble, that's for sure! I feel your pain, Nicole! Give Ozzie a hug for me, please! I won't really give advice because our puppy grew into a wonderful dog who continued to chew tissues from the trash and anything from the girls' backpacks that she could get. I know when she was little, we kept her in a gated room or her crate unless we were with her for probably 6 months and then we used baby gates to keep her in only certain parts of the house. The one thing I wish we had done was to take a puppy training class. I think that would have made a lot of difference. ACK!!!!!!! He coul dhave been fried. Oh my gosh mom. Well, this is a good leson for us all! Yipes!!! I left my iron on for a second and came back to find it burning(melting?) a hole through our berber carpet, all the way down to the pad. My dad still hasn't seen it(we rent from them) and it has been there for 6 years now. I keep it covered with an old sewing machine. It would be nice to move the machine but I'd rather not(at least not when they come to visit). Glad Ozzie is ok, that is very scary!! 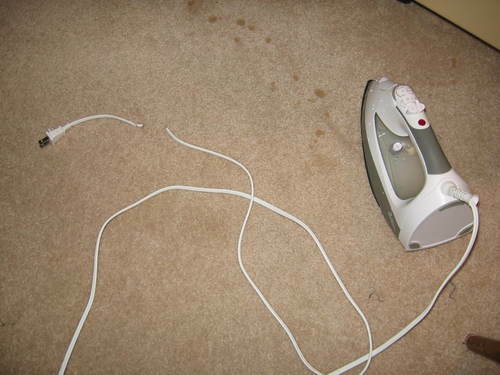 oh duh, forgot to say that it was a CAT that knocked my iron onto the carpet!! Sorry!